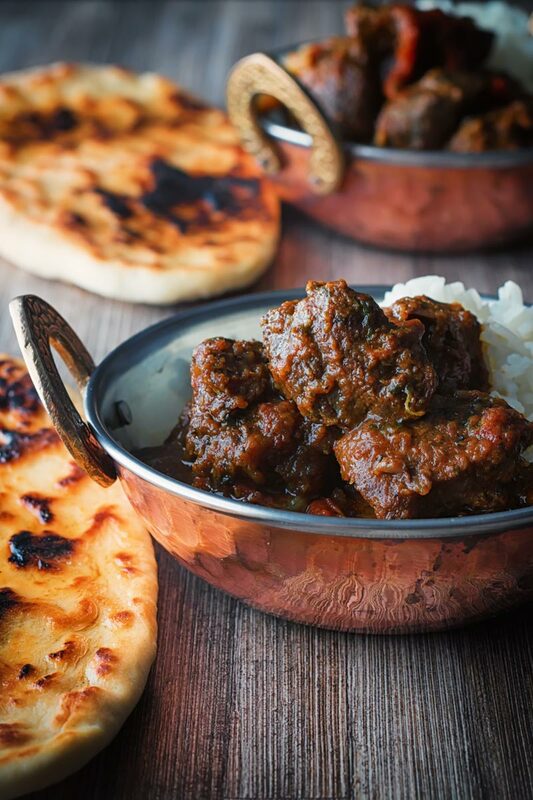 This Beef Vindaloo is my take on the Anglo Indian Vindaloo which is a take on the Indo Portuguese classic from Goa, who said fusion food is new? Yes, I know it is summer. Yes, I know it is hot out there! But aint nothing getting between me and my love for a good curry and this beef vindaloo is definitely good curry. Vindaloo has appeared here on the blog before with a fun pot roast take on a traditional pork vindaloo. It really is traditionally a pork dish with Portuguese leanings from India. Who said fusion food is new? This beef vindaloo though is much more like a traditional curry, a pile of beautiful, brown food. Food bloggers seem to have a problem with brown foods, most take the approach of liberally sprinkling with some green stuff to hide the brown. However, you all know that ain’t me! This is brown food at its best. It is hot, warming, welcoming spicy and all sorts of love wrapped up in a bowl. 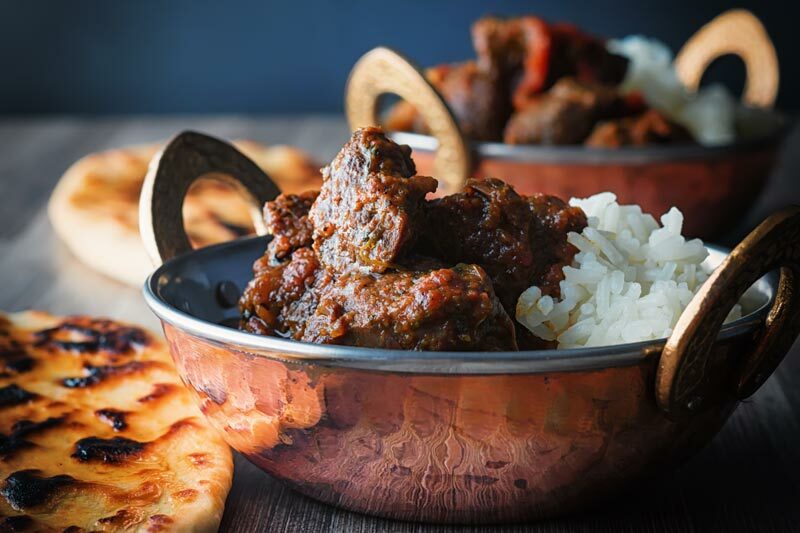 Like all good vindaloo this beef vindaloo has a wonderful astringent flavour. This is brought to you by vinegar, lemon juice, tamarind and a magical spice called armchoor which is also known as mango powder. Probably because it is made from dried ground green un-ripe mango, imaginative hey? It adds a rich sourness to the dish that the liquids do not bring on their own. It is certainly one of the less well-known spices in the Indian store cupboard but one I love. If I can get it out here in the Hungarian wilderness I suspect you should be able to dig it up with a little effort. If not you can omit it. I would not add any more sour liquids personally as that would take it off in the wrong direction. If you like sour notes in your spicy food you really should check out my Indian Chicken Pickle Recipe! 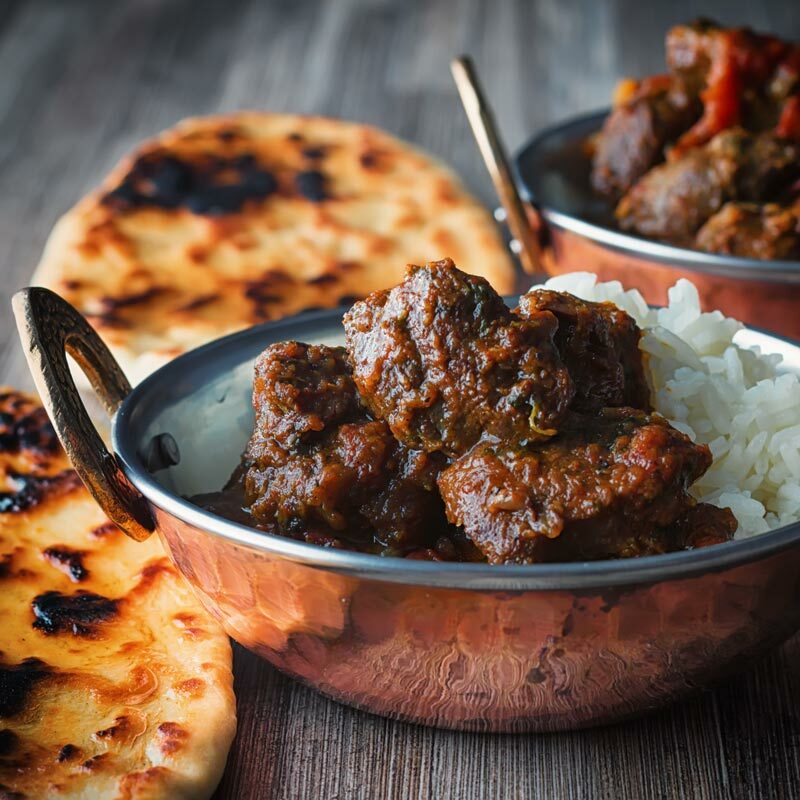 What To Serve With Your Vindaloo Curry? When it comes to sides for curry recipes I am a pretty simple guy. I strongly favour a simply boiled or steamed rice and a flat bread of some description. The reasoning behind that is that curries are so insanely punchy on flavour that often flavours in side dishes are often lost. But the idea also accounts for the spice in curries, plain rice and breads are perfect cooling agents. Now I’m not gonna tell you how to boil rice, there are a million sources online. The only advice I will offer make sure you season well enough. There is nothing more unpleasant than underseasoned rice as far as I am concerned. Bread on the other hand, bread I can definitely help you out with. I have mentioned before that naan bread is my first love when it comes to curry. Unless my curry is dry then it is always my go to, and this beef vindaloo recipe is certainly not a dry curry. Now you can, of course, opt for a chapati, and I can certainly help you out there too. This is my Chapati recipe! Curry and the Instant Pot. 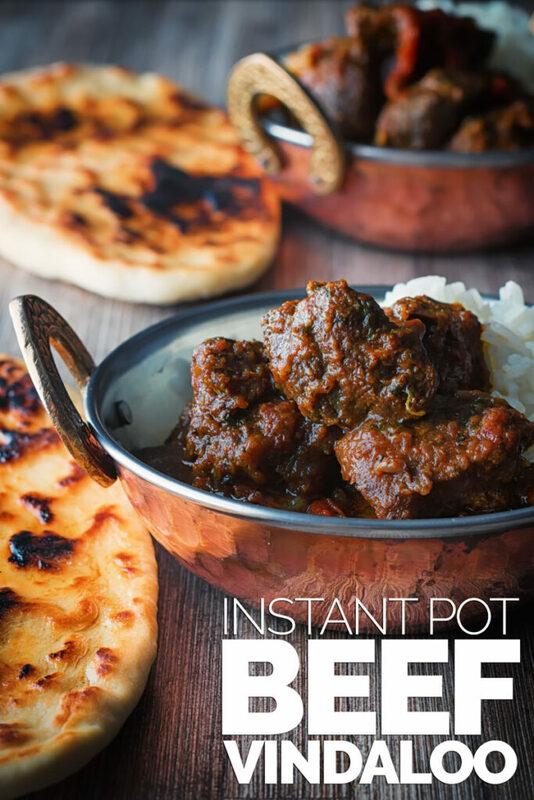 As you can see this beef vindaloo curry is cooked in the Instant Pot. But you could simmer on the stove top for 3 hours if you wish and it will be just as tasty. Personally, I hate having slow cooked food when I am hanging around the house, it is absolute torture for someone who works from home. It is like being waterboarded with the promise of dinner. You just have to wait 3 bloody hours whilst all the lovely goodness wafts around your nostrils. Whilst we are on the subject of the Instant Pot I received a kind comment from someone, a couple of weeks ago on a previous Instant Pot recipe. They complained that it was for the Instant Pot and that I did not make it clear enough. You know apart from it being in the title of both the recipe and page, the URL of the page. Oh yes, and the instructions and in the blurb. I wrote a lovely response in my own way. Explaining that if the person could not work out that the recipe was for the Instant Pot then they should probably not be allowed in the kitchen with sharp knives and hot stoves before taming it somewhat. Anyway if you are that person and you are reading this. THIS IS AN INSTANT POT RECIPE! Add all of the ingredients for the marinade with the exception of the cardamom pods to a blender and blitz to a paste. Add this paste with the cardamom pods to the chopped beef and allow to marinade for at least 12 hours although it is better to do it for 24. When your marinade is finished heat the ghee in either a frying pan (medium hot) or in the InstantPot (high) on saute mode and cook the onions for 10 minutes until golden. Now add the beef with the marinade and brown for five minutes. Add the remaining ingredients to your InstantPot, seal the lid and cook for 35 minutes on high pressure with a 10 minute natural pressure release. When the pressure has been released remove the solids from the sauce with a slotted spoon and reduce the sauce on saute mode (high) until a thick and unctuous sauce is achieved (stirring occasionally), this should take around 10 minutes. Return the beef to the sauce and stir to coat. You can of course cook this on the stove top, rather than use the InstantPot cook over a low-medium heat for 3 hours stirring occasionally. This is s fantastic recipe. I made it for 6 and increased the amounts of all ingredients accordingly, and it was wonderful. Even though I did not have enough time to marinate the beef, it turned out amazing. Rave reviews! You are welcome Gail… Thanks for taking the time to write back to me, I am so glad you enjoyed it, it is music to my ears and why I do this stuff! 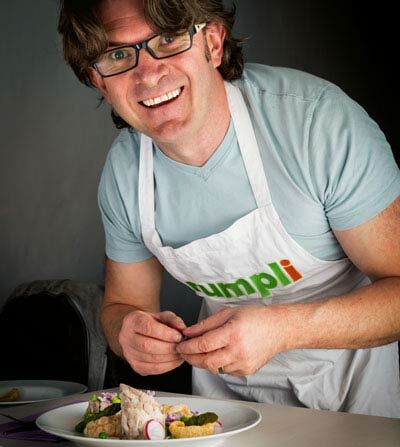 Useful feedback for me too, I typically cook for 2 or at a push 4 so great to hear how my dishes scale! Have fun with the IP, I use mine a lot although I only have about a dozen recipes here, it tends to be a bit of a workhorse cooking up sides or stocks rather than a meal cooking device for me, however for braises, curries and stews it really is a top piece of kit. I am making this dish on Friday and I quadrupled the recipe. The beef is already marinating. Do I quadruple the amount of water to the Instant Pot and do I pressure cook for the same time? I can’t wait to eat this and serve this to my guests. Thank You! Hi Gail… I typically only ever cook for two so have not tried such a large recipe but based on what I know of the IP then I would not quadruple the water in the recipe, you want as little as you can get away with in order to get the pot to seal I would personally look at around 350ml-500ml. It is a wet cooking environment so the meat should not dry out and you will need to reduce the sauce at the end. In your case there will be a lot more liquid so I would budget some extra time to reduce that in the pot after cooking or possibly look at doing it in a pan with a larger flat base on the stove top. As for timings you should be good, the extra volume will mean that the pot will take longer to come to pressure, but shin is a good old piece of meat and will not be affected by that adversely. Hi Brian, I’m Indian with a bit of Portugese blood thrown in and this looks absolutely delicious to me! I’ve made vindaloo befire but your indregients look different..esp with the use of amchoor. Let me try it out and I’ll come back to let you know how different the taste is from my traditional recipe. Beautiful photos! This looks and sounds delicious! I don’t have an instapot yet! Probably time to invest! Thanks Beth, the same with all these toys alternative cooking techniques are always available, 3-4 hours in a low oven would work wonderfully. Oh my that marinade sounds absolutely delightful! I’m curious to try that marinade with chickpeas or tempeh for a veggie version! Thanks. That sounds like an interesting experiment, I have a few vege curries but never done one in the vindaloo direction. 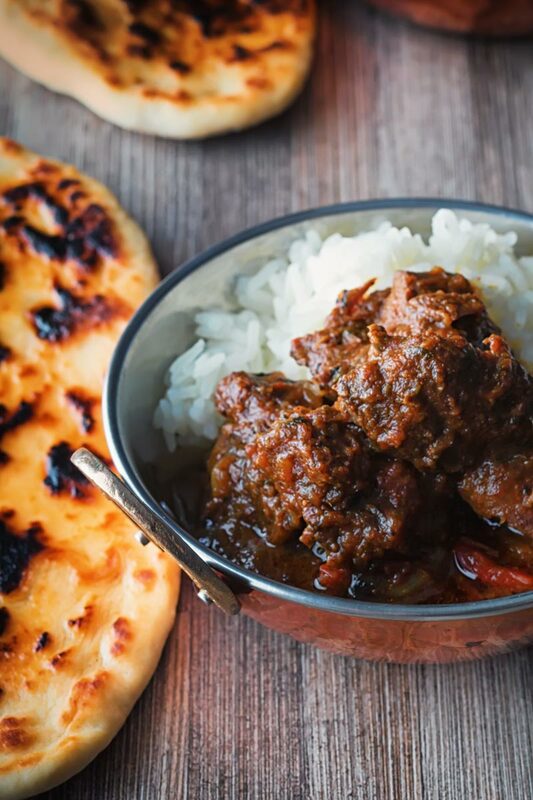 I love eating Vindaloo but have never actually made this. This is inspiring me to make this, your lovely photos are AMAZING! Thanks Tina, Vindaloo is a great curry. I absolutely love your photography! This recipe looks and sounds amazing – my kind of meal! I don’t have Tamarand powder or paste neither does my local supermarket with this recipe still be good without that element ? The recipe would still taste good, but obviously a little different. Some things to try and substitute with are pomegranate molasses, a lemon or lime marmalade, they will have a similar moisture content and whilst different relatively close flavour profiles, although without the earthiness. That gravy looks absolutely inviting – my mouth flooded with saliva just reading through the ingredient list! Yumm! Thanks Tina, this is real tasty. 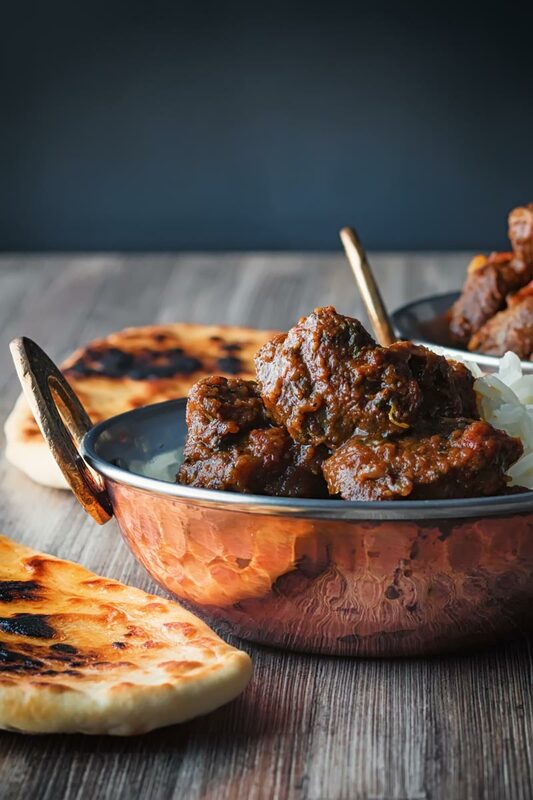 Brian your photos are just mesmerizing ~ I can’t take my eyes off this dish, ~ vindaloo is my husband’s fave and I’ve never attempted it, so thanks for the inspiration… only problem is I don’t have an Instant Pot yet, what is my problem? I’ve got to get with the program, this is too good to pass up. Thanks Sue…. Indian food has a great affinity with pressure cooking however it is not essential, it just takes a lot longer to get the tougher cuts tender and to allow the flavours to really develop. I am homebased so slow cooking is quite frankly torture, all those lovely aromas driving me nuts, so a pressure cooker is perfect for me.